Share this product and receive a $5.50 sharing discount. Violin photo by Keith Levit. 'It is good to make music to Your name, O Most High. Psalm 92:1.' 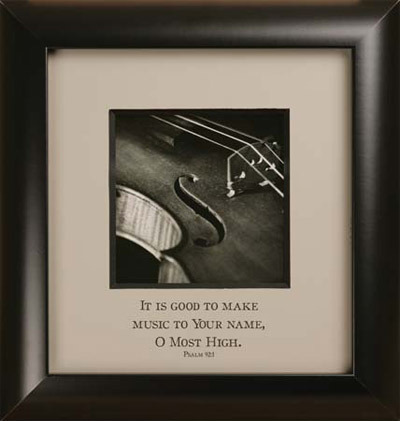 You cannot escape the beauty and elegance of this framed and matted inspirational lithograph. Using only real wood matting, ranging from 1/4" to 1/2" in thickness, this simple black frame accentuates this amazing lithograph. No glass is used. Glass mars the beauty of the presentaiton due to glare and smudging. Instead, a protective textured finish has been added to the print. 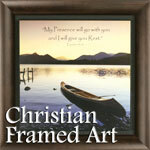 This piece of art is from our Simply Framed Collection. The print has been mounted, matted, and framed. A textured finish that both protects the art and creates the look and feel of painted canvas is added. Every framed product has been built with an insert saw-tooth hanger and corner bumpers that make these items a dream to hang on the wall. Measures 18" x 19".